Have you ever wanted to have your computer do something when you came home, or when you left? Here's a cheap and easy way to do it. Something like this could be easily run from cron (as root). A more sophisticated version would probably need to track the current state, possibly by touching and deleting a file, as to only act when it changes. Something else to note: My phone, it seems to ignore too many arp requests in a row. Of course YMMV. Once a minute seems to work though. So the --retry option is in there just in case one of the arp packets gets lost. The problem with RC cars and little kids is that RC cars are actually rather hard to control. And really, rather than standing there controlling the car, most kids would rather be chasing it around (at least, most of my kids would). 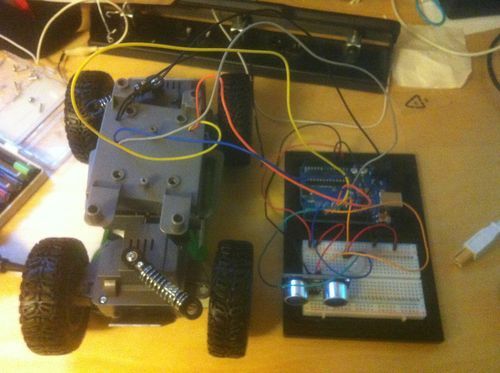 So I decided to see if I could build an RC car that drove itself, using an Arduino nano rather than a remote control. The first step was figuring out where the RC chip leads were connected. After that, I just needed to wire those leads into the arduino. I started out testing with an Arduino Uno, and once everything was working, I wired it up to the Nano I bought to actually use in the car. After I confirmed that was working, I put the car back together, drilled a hole in the top for the LED, and hot-glued the PING))) sensor to the front at about a 10 degree angle upwards. 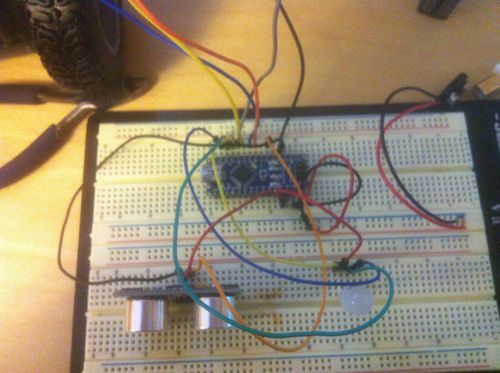 Arduino's libraries are so easy to work with, you almost forget you're writing C++. So I wrote a simple program to control the car. Since there's only one ultrasonic sensor, I needed a simple approach to avoiding obstacles (Summary: turn left). Here's the car driving around my toy-littered basement. There are still some improvements to be made here. 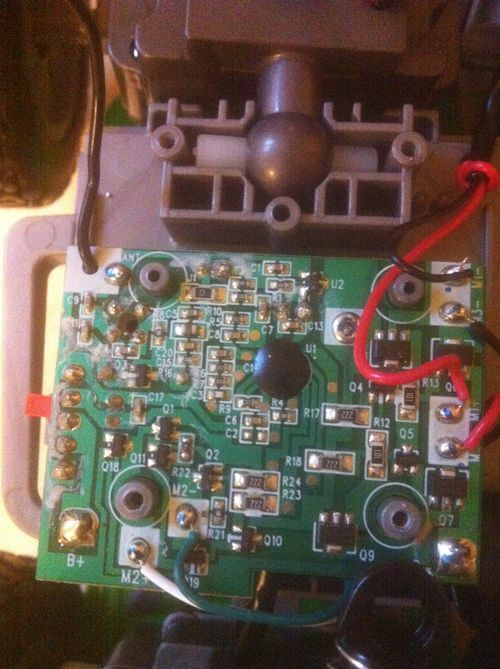 Finding a car that ran on 9 volt power would have greatly simplified the design...although most of those cars are much more expensive than the one that I bought. And I need to add a switch to control the arduino. Of course, this begs the question, is it still an "RC" car if it's not controlled remotely?